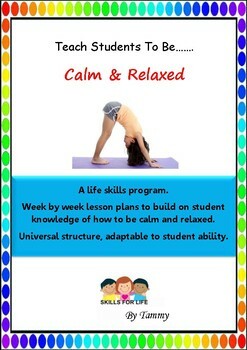 A complete week by week life skills program offering lessons on managing emotions along with a variety of activities to promote calmness and relaxation. 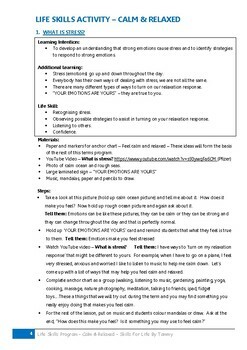 Looking at ways for students to turn on their relaxation response. An adaptable program of 1 hour weekly lessons, more than 10 weekly lessons available, so could be used as a term or unit of work. Adaptable to student ability. Each lesson includes a learning intention, additional learning opportunities and highlights the life skill being practiced; such as communication, social awareness, team work, confidence, personal independence etc. If you like this program, check out others in the same collection, including, teamwork, communication & emotional intelligence to name a few.